Use this model to carry out ANOVA (ANalysis Of VAriance) of one or more balanced or unbalanced factors. Available in Excel with the XLSTAT software. where yi is the value observed for the dependent variable for observation i, k(i,j) is the index of the category (or level) of factor j for observation i and εi is the error of the model. 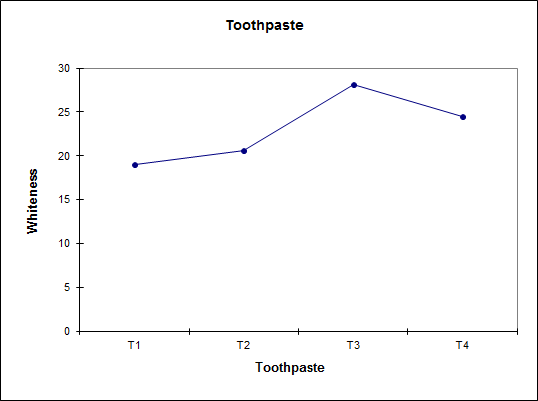 The chart below shows data that could be analyzed using a 1-factor ANOVA. The factor has three categories. Data are orange points. The dashed green line is the grand mean and the short green lines are category averages. Note that we use arbitrarily the sum(ai)=0 constraint, which means that β0 corresponds to the grand mean. XLSTAT allows to correct for heteroscedasticity and autocorrelation that can arise using several methods such as the estimator suggested by Newey and West (1987). XLSTAT enables you to perform one and multiple way ANOVA. Interactions up to order 4 can be included in the model as well as nested and random effects. 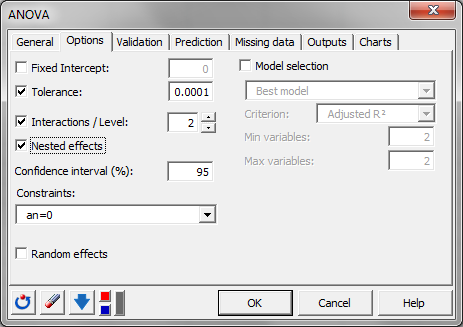 XLSTAT has an automatic device to find nested factors and one nested factor can be included in the model. Random factors can be included in an ANOVA. When some factors are supposed to be random, XLSTAT displays the expected mean squares table. Test assumptions: a Shapiro-Wilk test is performed on the residuals. A Levene's test is available to run a test on the homogeneity of variances. The test is run to compare for each factor, the variance of the different categories. Moreover, influence diagnostics are displayed for each observation including the residual, the standardized residual (divided by the RMSE), the studentized residual, the deleted residual, the studentized deleted residual, thee leverage, the Mahalanobis distance, the Cook's D, the CovRatio, the DFFit, the standardized DFFit, the DFBetas (one per model coefficient) and the standardized DFBetas. 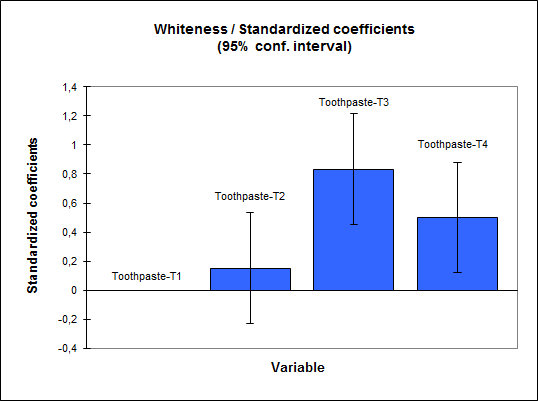 Standardized coefficients chart: The barchart displays the values and confidence intervals of the standardized coefficients. Regression chart: The chart shows the observed values, the regression line and both types of confidence interval around the predictions. Standardized residuals as a function of model predictions: In principle, the residuals should be distributed randomly around the X-axis. If there is a trend or a shape, this shows a problem with the model. The distance between the predictions and the observations: For an ideal model, the points would all be on the bisector. The standardized residuals on a bar chart: The last chart quickly shows if an abnormal number of values are outside the interval]-2, 2[ given that the latter, assuming that the sample is normally distributed, should contain about 95% of the data. 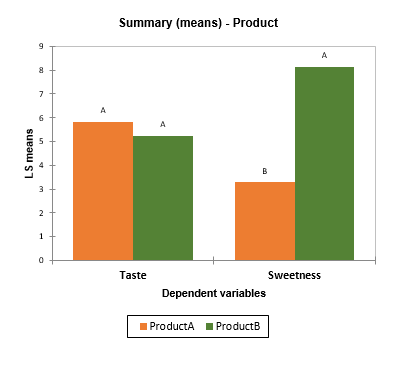 Summary charts: If several dependent variables have been selected and if the multiple comparisons option has been activated, a chart allows to visualize estimated means with multiple comparisons grouping letters.